When most Americans visit Tuscany, they head for Fiorenza (Florence) straight as an arrow. The city is indeed marvelous and the museums there are of a world-class order. History abounds from every back alleyway as well. It is one of Italy’s many concentrated culture points. It is definitely worth visiting. However, just a mere 74 kilometers away is another city that is rarely visited by tourists. It is equally impressive. Its name is Volterra. The town was at first a Neolithic settlement and an important Etruscan center. The site is believed to have been continuously inhabited as a city since at least the end of the 8th century BC. Like many other Italian cities, it is full of old history. There are hundreds of things to see in Volterra but in the center of the city there is a jewel that is often completely missed by tourists. It is the Guarnacci Etruscan Museum. This museum has one of Italy’s largest collection of Etruscan artifacts including a stunning display of cinerary urns. The Guarnacci museum is one of the earliest public museums in Europe. Founded in 1761 when the noble abbot Mario Guarnacci (Volterra 1701-1785) , a collector of antiquities, donated his archaeological collection to “the citizens of the city of Volterra”. The first Museum was housed in Palazzo Maffei ( in Via Matteotti then Via Guidi) purchased by Guarnacci to house his collection. At his death in 1785 the collection was transferred to the 13th century Palazzo dei Priori. Enriched by donations, purchases and further excavations , the director Niccolò Maffei transferred the museum to the Palazzo Desideri Tangassi in 1877. 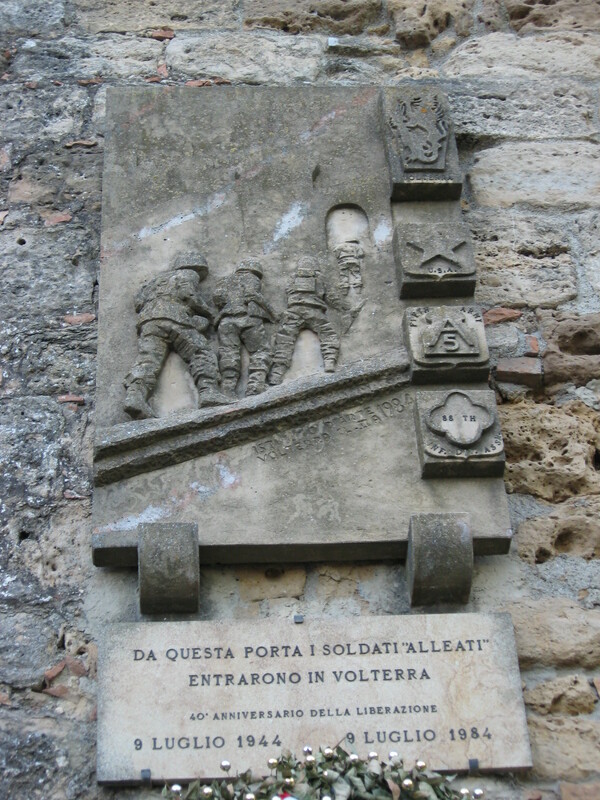 Volterra was also in modern times one of the many sites of Nazi occupation during World War II. The main gate to the city still proudly proclaims its liberation by allied troops with a memorial plaque, commemorating the 40th anniversary of its liberation on July 9, 1944. It brings to mind an often overlooked chapter of the brutal occupation of Tuscany by the Nazis. Whether its ancient history or modern history that intrigues you, Volterra is Tuscany’s hidden secret waiting for your discovery. If you are in Florence, make the short drive to Volterra. You’ll be glad you did. Here’s a link to the Guarnacci Tuscan Museum. Note about the main photo above: This is a cinerary urn found in the Guarnacci Etruscan Museum. It depicts a married Etruscan couple as they looked in life. I took this photograph and was so moved by the couple’s expression that a copy now hangs in my front room. The expression on their faces speaks of timeless love and respect. We can all learn from this couple. Lovely post you have there. Hopefully I will get to enjoy my Tuscany trip next month. Can’t wait for it. Hope you get a chance to visit Volterra. It’s a lovely city! Thank you for such an informative post! I am super intrigued by Volterra now and hope to go someday soon! I hope you get to Volterra. There is also a nearby town called Castagno where you can find the best T-bone steak in all of Italy, Mangia bene e godersi! Great post! Makes me want to visit Volterra.